Magmas erupted in deep-water environments (>500 m) are subject to physical constraints very different to those for subaerial eruptions, including hydrostatic pressure, bulk modulus, thermal conductivity, heat capacity and the density of water mass, which are generally orders of magnitude greater than for air. Generally, the exsolved volatile content of the erupting magma will be lower because magmas decompress to hydrostatic pressures orders of magnitude greater than atmospheric pressure. At water depths and pressures greater than those equivalent to the critical points of H2O and CO2, exsolved volatiles are supercritical fluids, not gas, and so have limited ability to expand, let alone explosively. Gas overpressures are lower in deep submarine magmas relative to subaerial counterparts, limiting explosive expansion of gas bubbles to shallower waters. Explosive intensity is further minimized by the higher bulk modulus of water, relative to air. Higher retention of volatiles makes subaqueously erupted magmas less viscous, and more prone to fire fountaining eruption style compared with compositionally equivalent subaerial counterparts. The high heat capacity and thermal conductivity of (ambient) water makes effusively (and/or explosively) erupted magmas more prone to rapid cooling and quench fragmentation, producing non-explosive hyaloclastite breccia. Gaseous subaqueous eruption columns and hot water plumes form above both explosive and non-explosive eruptions, and these can entrain pyroclasts and pumice autoclasts upward. The height of such plumes is limited by the water depth and will show different buoyancy, dynamics, and height and dispersal capacity compared with subaerial eruption columns. Water ingress and condensation erosion of gas bubbles will be major factors in controlling column dynamics. Autoclasts and pyroclasts with an initial bulk density less than water can rise buoyantly, irrespective of plume buoyancy, which they cannot do in the atmosphere. Dispersal and sedimentation of clasts in water is affected by the rate at which buoyant clasts become water-logged and sink, and by wind, waves, and oceanic currents, which can produce very circuitous dispersal patterns in floating pumice rafts. Floating pumice can abrade by frictional interaction with neighbors in a floating raft, and generate in transit, post-eruptive ash fallout unrelated to explosive activity or quench fragmentation. Understanding the physical processes controlling the dynamics, style and intensity of volcanic eruptions has historically relied upon observations of recent subaerial eruptions (e.g., 1980 Mt St Helens, Lipman and Mullineaux, 1981; 1991 Mt Pinatubo, Newhall and Punongbayan, 1996; 1982 – present Hawai’i, Poland et al., 2014; Soufriere Hills, Montserrat, 1995–2012, Druitt and Kokelaar, 2002) and well-preserved subaerial eruption deposits (e.g., Askja, Carey et al., 2010; Colli Albano, Giordano et al., 2010; Vesuvius, Shea et al., 2011; Santorini, Druitt et al., 1999; Simmons et al., 2016; Tenerife, Marti and Geyer 2009, Edgar et al., 2017). However, volcanism on Earth principally occurs in the submarine realm (at mid-ocean ridge systems, intraplate hotspots/seamounts, oceanic plateaus, oceanic volcanic arcs), under eruptive conditions distinct from atmospheric or subaerial vent settings (McBirney, 1963; Cas, 1992; Head and Wilson, 2003; White et al., 2003, 2015a,b; Wohletz et al., 2013; Cas and Giordano, 2014; Carey et al., 2018; Manga et al., 2018). 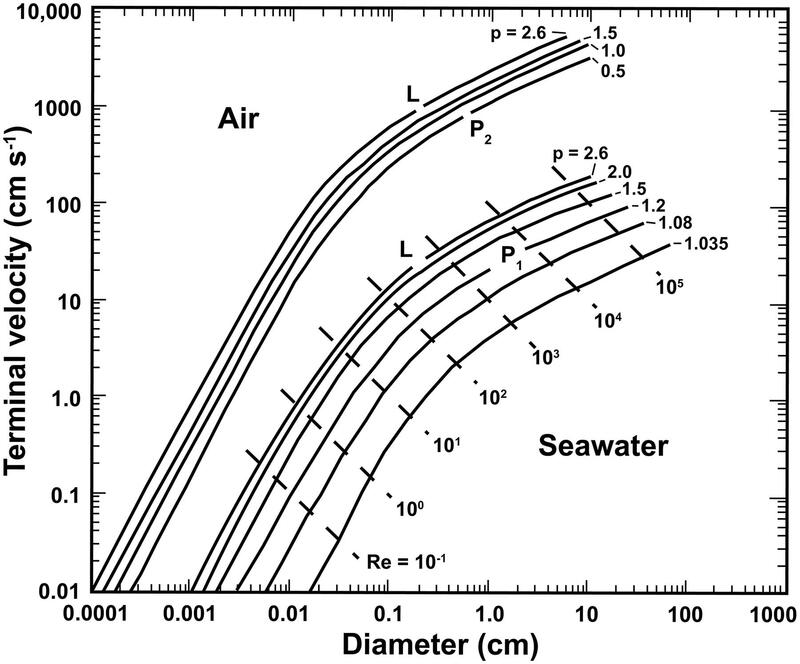 The heat capacity, thermal conductivity, density, viscosity, pressure gradient and bulk modulus of (sea)water, in particular, are each generally orders of magnitude larger than the properties of the atmosphere at subaerial vents (Table 1), which will greatly affect eruption processes. Studies of uplifted subaqueous volcanic deposits preserved in the geological rock record (e.g., Cas, 1978, 1992; Dimroth et al., 1978; de Rosen-Spence et al., 1980; Furnes et al., 1980; Busby-Spera, 1984, 1986; Cas and Wright, 1987; Allen, 1992; Mueller and White, 1992; McPhie et al., 1993; Kano et al., 1996; Scutter et al., 1998; Hunns and McPhie, 1999; Gifkins et al., 2002; Cas et al., 2003; Fujibayashi and Sakai, 2003; Goto and Tsuchiya, 2004; Cas and Giordano, 2014; Soriano et al., 2016; and many others) and relatively recent observations of modern sea floor volcanism and deposits (e.g., Moore, 1975; Batiza et al., 1984; Fornari, 1986; Cashman and Fiske, 1991; Fiske et al., 1995, 1998; Batiza and White, 2000; Wright et al., 2006; Deardorff et al., 2011; Resing et al., 2011; Clague et al., 2013; Embley et al., 2014; Chadwick et al., 2016; Carey et al., 2018; Embley and Rubin, 2018; Manga et al., 2018; and many others) have provided important insights into the processes governing submarine volcanism and the deposit characteristics. TABLE 1. Advantages and limitations of studies of ancient submarine successions and modern seafloor settings. Although study of both modern and ancient submarine volcanic settings and successions have benefits, they also have limitations as to how much information can be accessed, documented and interpreted (Table 1). In ancient deep-water volcanic successions, the major limitation is the lack of understanding of the actual water depth at the time and place of eruption and deposition. As we will see, water depth determines the ambient hydrostatic pressure, and as a result magma properties, eruption style and the deposit characteristics. In modern submarine settings, even if the water depth and hydrostatic pressure are known, unless the physics of the processes at those water depths are carefully evaluated and understood, mistakes in interpreting the eruption processes and origins of deposits are commonly made, including erroneous assignation of some subaerial eruption styles to deep water settings. In this review, we will outline the physical properties and effects of an ambient water mass on magma properties and eruption dynamics in deep-water environments (>500 m), discuss the deposits or products of subaqueous eruptions from observations in modern and ancient deep-water seafloor settings, and highlight the differences between subaqueous and subaerial eruptions. There are few papers which have attempted this to date (e.g., McBirney, 1963; Cas and Wright, 1987; Head and Wilson, 2003; White et al., 2003; Cas and Giordano, 2014). This current paper represents a significant and comprehensive update. where g is gravitational acceleration (9.8 m s−2), ρ is the density of water (1000 kg m−3 for fresh water and 1020–1030 kg m−3 for sea water), and d is the depth or thickness of the overlying water column (in meters; Figure 1 and Table 2). Hydrostatic pressure thus increases at a rate of ∼9.8 MPa km−1 of water depth, which is ∼10,000× greater than the atmospheric pressure gradient of about -0.009 MPa km−1 with altitude (Table 2). At a water depth of 100 m, the hydrostatic pressure is 1 MPa (10× atmospheric pressure, AP), at 500 m, 5 MPa (50× AP), at 1000 m, 10 MPa (100× AP), at 1500 m, 15 MPa (150× AP), at 2000 m, 20 MPa (200× AP; Figure 1), and so on. The increasing pressure with increasing water depth has the effect of modifying the physical properties of the erupting magmas, particularly the timing of volatile saturation and exsolution, the state of exsolved volatiles, and magma viscosity (McBirney, 1963; Wallace and Anderson, 2000; Wallace et al., 2015). FIGURE 1. Pressure gradients for water (hydrostatic), magma (magmastatic), various crust types, and the mantle (lithostatic). TABLE 2. Physical properties of water and air (from Cas et al., in press). FIGURE 2. 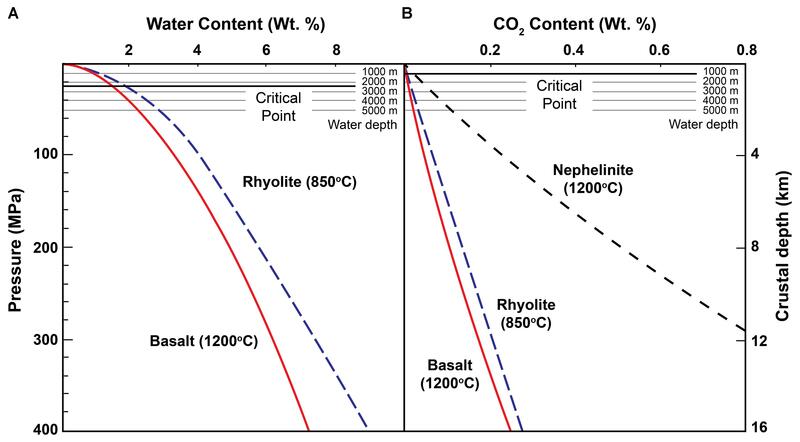 Volatile saturation curves for (A) H2O and (B) CO2 in basalt and rhyolite magmas as a function of confining pressure and equivalent depth in the crust. Also shown are hydrostatic pressure lines corresponding with particular water depths. Exsolution of volatiles would be short-circuited if eruption occurred at those water depths, indicating that less of the volatile fraction would exsolve in subaqueously erupting magmas compared with equivalent magmas erupting and decompressing to atmospheric pressures of 0.1 MPa. (Volatile and pressure data from Wallace et al., 2015, Figures 7.1, 7.2, respectively, other parameters are ours). where DCR is the depth in the crust at which exsolution occurs in meters, Psat is the volatile saturation pressure (MPa), PHYD (MPa) is the hydrostatic pressure at the depth of the vent in the water body, and Lgr is the lithostatic pressure gradient (MPa km−1) for submerged continental, arc, or oceanic crust. For example, at a water depth of 1 km, rhyolite magma with 4 wt. % dissolved H2O, or a basalt magma with 3 wt. % dissolved H2O, becomes water saturated at crustal pressures of 90.2 MPa (=100 MPa–9.8 MPa), equivalent to a submarine crustal depth of ∼3.6 km. At 2 km water depth, with a hydrostatic pressure of 19.6 MPa, the lithostatic pressure component is 80.4 MPa, equivalent to a volatile saturation depth in the crust of ∼3.2 km, and at 3 km water depth the volatile saturation pressure equivalent depth in the crust is ∼2.8 km. Equally importantly, the exsolution of volatiles will cease earlier in submarine settings compared to their subaerial counterpart because the erupting magma decompresses to higher ambient eruption pressures with increasing vent water depths. Consequently, less of the dissolved volatile component will exsolve, meaning a smaller fraction of volatiles is potentially available to drive explosive eruptions in submarine settings. This principle also applies to sub-glacial settings and other planetary bodies with dense atmospheres. For example, on Venus, the atmospheric pressure is 9.2 MPa (Taylor, 2010; Airey et al., 2015), which is equivalent to a depth of ∼1 km in the Earth’s oceans. Geochemical compositional data and pre-eruptive volatile content can be used to determine degrees of exsolution and residual H2O volatile content in magmas rising and decompressing in a conduit at various pressures, using the modeling software CONFORT 15 (Campagnola et al., 2016; Figure 3). Using data from Carey et al. (2018) and Manga et al. (2018) for rhyolite samples erupted at water depths of 900 m at the wholly submarine Havre volcano in the Kermadec arc, Southwest Pacific in 2012 (9 MPa confining hydrostatic pressure; pre-eruptive water content of 5.8 wt%; eruption temperature of ∼850°C), we calculate that the residual water content after exsolution at 900 m water depth, and assuming ascent through a 20 m diameter cylindrical conduit, is about one quarter the original magmatic water content (Figure 3B). FIGURE 3. (A) Modeled variation in residual dissolved magma H2O content in a crystal-poor, rhyolitic magma during magma decompression and ascent in a 20 m diameter cylindrical conduit, based on compositional data from Carey et al. (2018) and Manga et al. (2018) for samples from the 2012 submarine eruption of Havre volcano, Kermadec arc, southwest Pacific, using CONFORT 15 modeling program of Campagnola et al. (2016). (B) Enlargement of the field shown in the box in (A). The solid and dotted blue lines show the residual magmatic water content left after the magma had vesiculated to ∼75 vol% for varying volatile contents. The solid blue line represents the initial 2012 Havre magma H2O content of 5.8 wt% (Manga et al., 2018). Red lines show the calculated depths and residual water contents coinciding with the conditions for the strain rate criterion that would cause explosive fragmentation. In each modeled simulation, a fraction of the available initial volatile content remains dissolved in the magma (top axis) at the point of fragmentation and the depth of fragmentation increases as a function of increasing initial volatile content. Note, strain rate driven fragmentation only occurs at depths of <500 m, even if the initial magmatic water content was 8 wt. %. Even high levels of vesiculation in erupting subaqueous magmas do not ensure an explosive eruption because the physical state (vapor/gas versus supercritical fluid versus liquid) and the specific volume of exsolved volatiles in magma in conduits or lavas, and of volatile bubbles released into water masses is directly related to the confining pressure (McBirney, 1963; Wallace and Anderson, 2000; Cas and Giordano, 2014; Wallace et al., 2015). The transition between liquid and vapor states occurs at the critical point pressure and temperature of a particular volatile species. At and above the critical point, the fluid is supercritical, which is almost incompressible, and the liquid and vapor states are indistinguishable. The critical point pressure and temperature for fresh H2O (magmatic volatiles) are ∼22 MPa and 374°C, respectively, and for CO2 they are ∼7.8 MPa and 31°C, respectively. For magma in a closed conduit in continental or arc crust under lithostatic pressure, exsolved magmatic H2O bubbles are supercritical at depths >900 m (i.e., the lithostatic pressure is 22 MPa at ∼900 m in the crust). In oceanic crust, the equivalent supercritical pressure depth is ∼750 m, due to the higher lithostatic pressure. In comparison, the supercritical depth of exsolved magmatic H2O in an open column of silicic and basaltic magma in continental crust is ∼980 m and in oceanic crust, ∼830 m. In an open body of water, the water depth that coincides with the supercritical pressure for exsolving magmatic H2O (fresh) is 2200 m, meaning that H2O exsolving in an erupting magma, or released from a vent as fluid bubbles at those depths, is a supercritical fluid. The equivalent critical pressure depth for CO2 is ∼800 m.
Supercritical fluids are dense (∼322 kg m−3; Pioro and Mokry, 2011), almost incompressible, and volumetrically limited compared with their gaseous form, and therefore cannot expand explosively (Figure 4; McBirney, 1963). 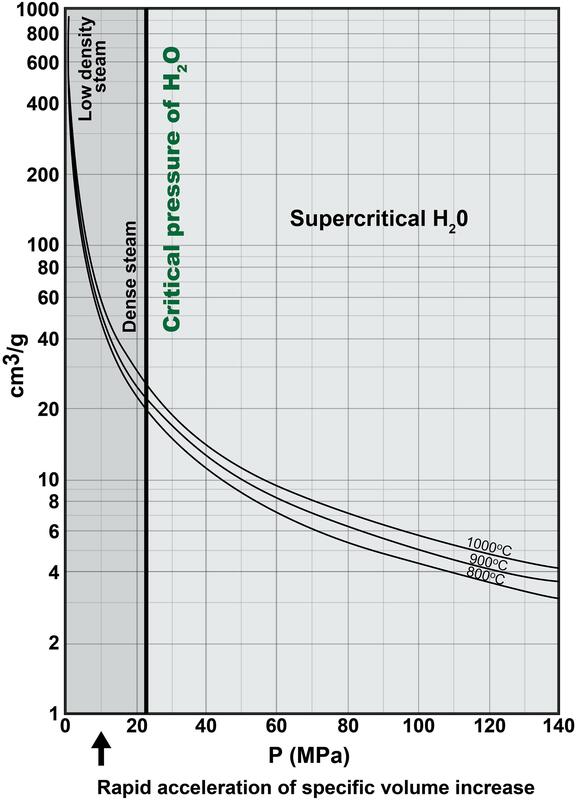 If magma rises to confining pressures less than the critical pressure, the supercritical fluid transforms through boiling to dense steam (∼10 kg m−3), leading to a slight increase in specific volume, which then increases exponentially at lower pressures as dense steam transforms into low density steam or gas (∼1 kg m−3; Figure 4). At P < 10 MPa (equivalent to 1 km water depth), the rate of change in specific volume and abundance of exsolved water bubbles in magma increases dramatically, which reduces the bulk density, but dramatically increases the bulk vesiculated volume, buoyancy and ascent rates of the magma in the crust. The vesiculated magma then has the potential to fragment explosively (Figure 4; McBirney, 1963). FIGURE 4. Specific volume of water as a function of pressure and magma temperature. At pressures >22 MPa (the critical point for water), exsolved water in high temperature magmas exists as a dense supercritical fluid. Exsolved water transitions from a supercritical fluid to a vapor or steam as the pressure decreases below the critical point. The change in physical state and decreasing confining pressure leads to an associated increase in the rate of specific volume growth, which further accelerates with decreasing pressure. (Modified from McBirney, 1963, Figure 2, by annotating fields and labels; permission granted by Springer Nature License 4375341235103). where σ is the total shear stress applied, η is the viscosity, γ is the strain rate, and n is a constant that is <1 for pseudo-plastic behavior and = 1 for Bingham behavior. where k is a constant, G is the magma elastic or shear modulus, and η is the viscosity. This process requires very rapid growth rates of steam-filled bubbles and high magma decompression rates (Cashman et al., 2000; Spieler et al., 2004; Cashman and Scheu, 2015; Gonnermann, 2015), which readily occurs in subaerial settings, even if the volatile content is only moderately high (Shea et al., 2011; Simmons et al., 2017a,b). In subaqueous settings, as water depth and hydrostatic pressure increase, it becomes increasingly difficult for the gas over-pressure (= gas bubble pressure – ambient pressure) to exceed the tensile strength of magma (Eq. 5), which is ∼5–6 MPa. At water depths of 500 m the ambient pressure is 5 MPa, so the gas pressure in vesicles in an erupting magma would have to be >10 MPa, unless gas bubble content released into the water column above the vent is high enough (∼50–100%, depending on the magma volatile content and vesicle gas pressure) to significantly lower the density and ambient pressure of the water column, so reducing the minimum gas over-pressure required to initiate an explosive eruption (cf. Mitchell et al., 2018). 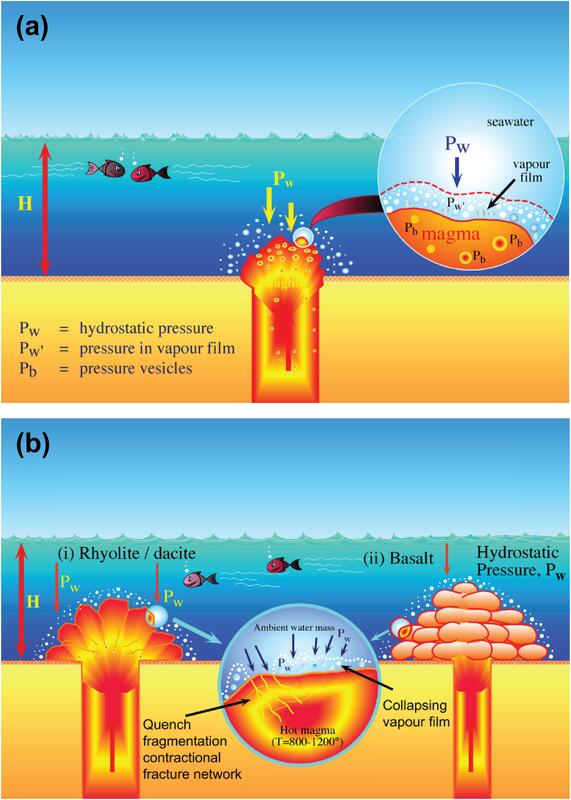 At 1 and 2 km water depth, the hydrostatic pressures are ∼10 and 20 MPa, and the gas pressure in bubbles would have to be >15 MPa and >25 MPa, respectively, in order to initiate an explosive eruption. However, 25 MPa is well above the critical pressure of water, and consequently the exsolved magmatic water in the magma would be supercritical, or pseudo-critical fluid with an extremely low expansivity factor (<<<0.1; Pioro and Mokry, 2011). To put this into context, Thomas et al. (1994) calculated that the gas pressures during the highly explosive, subaerial, caldera-forming 3.6 ka Minoan eruption on Santorini was 18 MPa, during the 232 AD Taupo eruption (New Zealand) it was 20 MPa, and during the 780 ka Bishop Tuff eruption from Long Valley caldera, California, it was 27 MPa. If these eruptions were to occur in submarine environments, they would be ineffectual at water depths of 1300, 1500, and 2200 m water depths, respectively, but probably at even shallower water depths, given the effects of hydrostatic pressures on the specific volumes and expansion rates in gas bubbles. Manga et al. 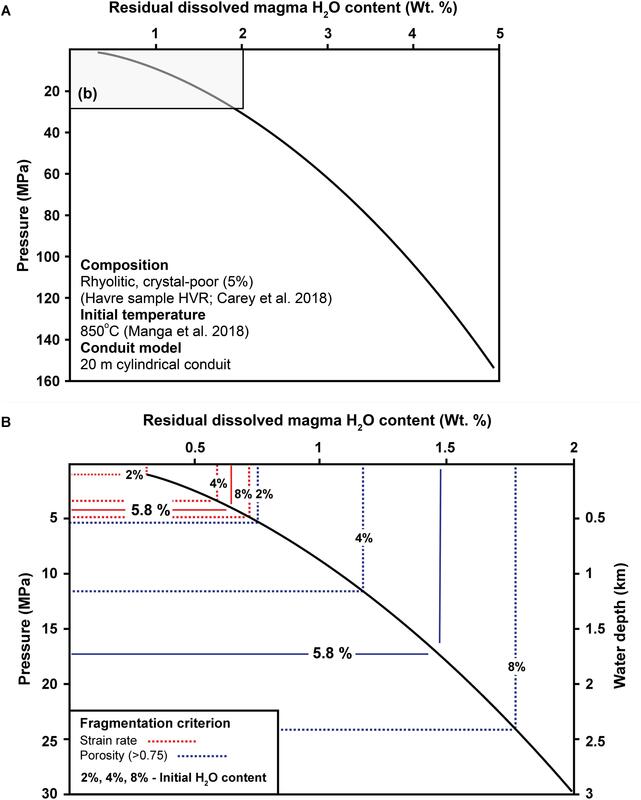 (2018) determined that the strain rate in vesiculated rhyolite magma rising in the conduit toward a vent at water depth of 900 m during the 2012 submarine Havre volcano eruption was orders of magnitude below the strain rate threshold criterion for explosive fragmentation of magma determined by Papale (1999). Our calculations using CONFORT 15 (Campagnola et al., 2016), using whole-rock compositions and pre-eruption melt inclusion data for erupted 2012 Havre pumice from Carey et al. (2018) and Manga et al. (2018), demonstrate that explosive strain driven fragmentation would only be possible at water depths <500 m (Figure 3B). Even if the Havre magma had 8 wt% H2O, it would not erupt explosively at depths >500 m using the strain-rate driven fragmentation criterion (Figure 3B). In some cases, weak explosive eruptions may occur at water depths from 1500 to 500 m, while more intense explosive eruptions can occur at depths <500 m (Cas, 1992; Fiske et al., 1998; White et al., 2015b), but only if the volatile content, strain rate affecting magma in the conduit and gas over-pressures are high enough. Otherwise, coherent lavas, including highly vesicular pumice lavas, can form, as occurred during the 2012 submarine Havre eruption (Carey et al., 2018; Ikegami et al., 2018; Manga et al., 2018). Our calculations for deep-water pumiceous submarine rhyolite from Sumisu volcano, Izu-Bonin arc (Allen et al., 2010), are very similar. In both the Havre and Sumisu eruptions (as well as other cases), abundant pumice was produced, but NOT by explosive mechanisms. In subaerial, low atmospheric pressure settings, there are many lavas that are erupted with highly pumiceous, coherent or autobrecciated carapaces (Figure 5a; 50–80% vesicles; e.g., Fink and Manley, 1987; Fink et al., 1992). This indicates that volatile content and gas over-pressure were greater than the yield strength of the magma so allowing bubble growth under low strain conditions, but less than the tensile strength of the magma in the bubble walls (i.e., ys < ΔP < τ), so preventing brittle explosive fragmentation. FIGURE 5. Coherent and autoclastic pumice carapaces on felsic lavas. (a) Subaerial rhyolitic Rocche Rosse lava, Lipari Island, Italy, showing an in situ, flow-banded, highly vesicular, coherent pumice domain. (b) Highly vesicular, coherent rhyolitic pumice surface of submarine lava dome at water depth of 1210 m, from Sumisu submarine volcano, Izu-Bonin arc, Japan, showing a rough columnar jointing on curvi-planar surface on right side. Field of view: 5 m wide. (c) polygonal giant pumice blocks, Sumisu volcano, 960 m water depth. The large block is 3 m in diameter and the left hand planar surface shows small scale polygonal, cooling jointing. (d) 5–30 cm diameter pumice blocks, some with planar surfaces and polygonal form, Sumisu volcano, water depth of 430 m. [(b–d) are from Allen et al. (2010), parts a, c, e, of Figure 2, reproduced with permission of the senior author S. Allen, and under “fair use” provisions of the Geological Society of America: https://www.geosociety.org/GSA/Publications/InfoServices/Copyright/GSA/Pubs/guide/copyright.aspx]. 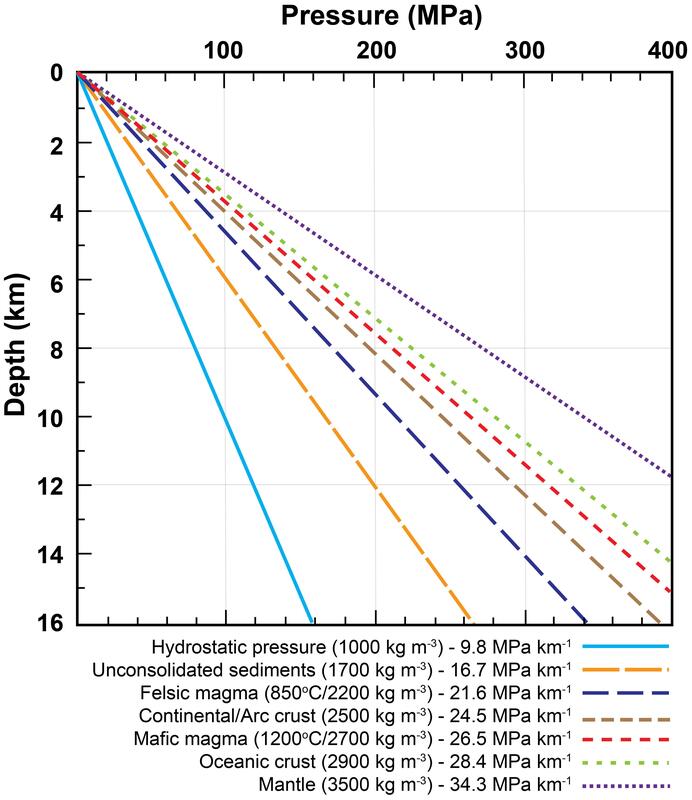 Since subaqueously erupting magmas decompress to much higher ambient pressures, particularly in deep water, compared with subaerial eruptions, this will significantly lower volatile exsolution and vesicle growth rates (Figure 2), and the level of gas over-pressure with increasing water depths. In magmas erupted at water depths (or under thick ice) and pressures where the rate of decompression, and the level of gas over-pressure are too low to drive explosive fragmentation, highly vesicular lavas, even with rhyolite compositions (Figures 5b–d; de Rosen-Spence et al., 1980; Furnes et al., 1980; Cas and Wright, 1987; Cas, 1992; McPhie et al., 1993; Scutter et al., 1998; Binns, 2003; Kano, 2003; Allen et al., 2010; Rotella et al., 2015; Carey et al., 2018; Ikegami et al., 2018; Manga et al., 2018), can form because gas bubbles will grow more slowly than under atmospheric conditions. 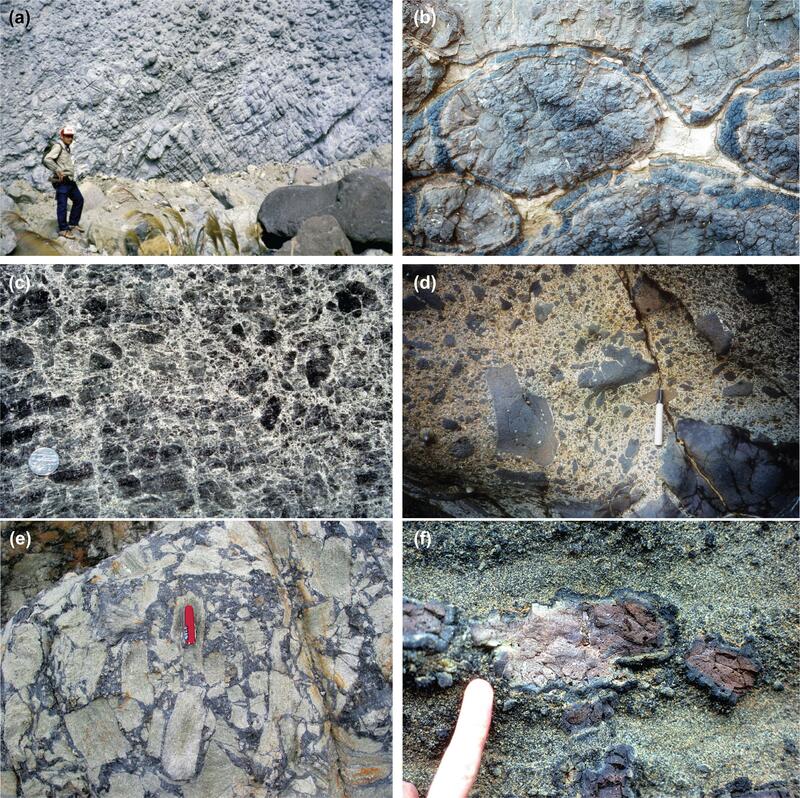 The pre-historic rhyolite lava dome-forming eruption of Sumisu volcano at water depths from 430 to 1210 m (Allen et al., 2010), in which the magmatic H2O content was ∼5.5 wt%, produced highly vesicular, coherent pumice lava dome carapaces (Figures 5b–d). Similarly, the 2012 submarine Havre volcano eruption, at a water depth of ∼900 m, involving rhyolite magma with pre-eruption magmatic H2O content of 5.8 wt% was effusive, and produced lava domes with highly vesicular pumice carapaces (70% vesicles; Carey et al., 2018; Ikegami et al., 2018; Manga et al., 2018). Subaerially, such lavas would almost certainly have erupted explosively because gas over-pressures would have been much higher. The presence of highly vesicular deep-water basalt lava (56% vesicles; Dixon et al., 1997; 44% vesicles; Fujibayashi and Sakai, 2003) indicates that the same constraints affect lower viscosity magmas as well. Empirical observations that there is a decrease in pyroclastic deposits with increasing ocean depths (e.g., Gregg and Fink, 1995; Grosfils et al., 2000; Wright et al., 2006) also provide support for this theory. So far, this review has focused on scenarios involving gas over-pressures relative to hydrostatic pressures in subaqueous settings. However, at increasing water depths and hydrostatic pressure there is an increasing probability that significant under-pressures can occur in some cavities in erupted volcanic deposits and even in erupting gas bubbles released into the water column as they cool and condense. At high enough under-pressures, catastrophic cavitation or implosions will occur. In implosions, debris is concentrated by collapse rather than being energetically dispersed far from source, as occurs during explosions. As subaqueous lavas cool, gas in cavities may escape, cool and condense, creating a low-pressure cavity, or lava may drain from an internal lava tube creating a cavity that is under-pressured. If the hydrostatic pressure exceeds the pressure in the cavity and the strength of the chilled glassy surface lava crust (∼7 MPa, but less if that crust has micro-fracture flaws, which is likely during chilling and contraction of glass), the cavity will collapse or cavitate energetically and implosively. Moore (1975) documented this during an eruption of Kilauea volcano, Hawai’i, when lava entered the sea and formed pillow lava tubes off-shore. As lava drained from some pillow tubes, gasses cooled leading to implosive cavitation of evacuated pillow tubes. The glassy lava crust of subaqueous lavas will be weakened by in situ, contractional cooling cracks at all scales. Visible and cryptic networks of cracks result in loss of tensile strength, which facilitates cavitation collapse of the crusts of drained lava tubes and pillows subject to high hydrostatic pressure. If water permeates into the cavities before cavitation occurs, the hydrostatic pressure in the cavity will balance that outside, and no collapse will occur. Gas bubbles in a liquid can also cavitate implosively (Rayleigh, 1917; Fujikawa and Akamatsu, 1980; Brennen, 1995). This also requires an under-pressure differential between the gas bubbles and the external fluid. Spherical bubbles are the most difficult to cavitate because of the effects of surface tension forces (Brennen, 1995). If gas filled bubbles are compressed, this normally leads to significant pressure and temperature increase (Brennen, 1995). However, cooling and condensation can reduce both (Fujikawa and Akamatsu, 1980), and if bubbles are deformed by asymmetric pressure gradients or by stretching, they are more prone to collapse (Brennen, 1995). Gas bubbles in vesiculating magmas erupting on the seafloor, and superheated bubbles of gas or ambient water being released from deep subaqueous vents into the overlying water mass, will be subject to rapid cooling, leading to condensation of gas in the bubbles, rapid decrease in internal bubble pressure, facilitating collapse or implosions. Some acoustic pulses detected during modern submarine eruptions and described as explosions, could in fact be largely implosions (e.g., some gas release events from the 2009 West Mata submarine eruption, Lau Basin at 1200 m water depth; Resing et al., 2011; lava tube collapse during the 2015 eruption at Axial Seamount volcano, East Pacific Rise at water depths >1500 m; Chadwick et al., 2016). Although implosions trigger an immediate shock or pressure wave and acoustic signals, and the implosion motion is inwards, there can then be a rebound against solid surfaces leading to limited ejection of solids and disintegrating bubbles away from the implosion source, mimicking explosions. • First, magmas will be prone to erupt through fire fountaining on the sea-floor if magma ascent rates are high. Exsolved volatiles at high hydrostatic pressures, whether they are supercritical fluids (density ∼322 kg m−3; Pioro and Mokry, 2011) or dense steam (density ∼ 10 kg m−3), will lower bulk magma density, and enhance buoyancy and rise rate. Even silicic magmas may erupt through submarine fire fountaining if the magma viscosity is low and discharge rate is high (e.g., Mueller and White, 1992). • Secondly, if magma viscosity is lower, even silicic magmas can produce unusually far flowing submarine lavas in deep water (e.g., Early Devonian Merrions dacitic lavas, >60 km flow distance; Cas, 1978; Lau Basin dacitic lavas, >10 km flow distance at 2500 m water depth; Embley and Rubin, 2018). • Third, because viscosity is inversely proportional to strain rate (Eq. 6), vesicles in magma erupting on the deep-sea floor will grow more easily than subaerial counterparts because magma viscosity is lower. However, lower viscosities require higher strain rates (Eq. 6) to meet the strain rate induced brittle explosive fragmentation criterion of Papale (1999), Campagnola et al. (2016), and because gas bubble overpressures are lower than in subaerial counterparts, they are less likely to disrupt explosively, again reinforcing the likelihood of finding more coherent, highly vesicular lavas on the deep-sea floor than in subaerial settings. However, counteracting the effects of pressure in lowering magma viscosity in deep-water are the effects of increased cooling rates of the surfaces of submarine lavas that cause rapid formation of a solid strong crust (Griffiths and Fink, 1992; Gregg and Fink, 1995). Strong, thick crusts may confine the liquid magma, enhance lava flow inflation and limit flow mobility. This effect is likely to be more significant at low effusion rates than at high effusion rates because a larger proportion of the lava can solidify quickly (Griffiths and Fink, 1992; Gregg and Fink, 1995). In addition, quench crystallization of microlites as a result of rapid cooling of flow margins could enhance bulk viscosity of some erupted lavas and affect their flow behavior (e.g., Saar et al., 2001). Unfortunately, the effects of a cooling confining crust, pressure and crystal content cannot be modeled in an integrated way at present using viscosity modeling packages such as those of Giordano et al. (2008), which is based on chemical composition, temperature, volatile content at atmospheric pressure and a crystal free basis. In addition, slope upon which lavas are erupted and flow can significantly affect the flow behavior and morphology of lavas (Ikegami et al., 2018). The intensity of an explosive eruption, or the extent to which it affects its surroundings, can be measured by the bulk modulus of the surrounding material (i.e., its resistance to compressibility, or the rate of change of volume decreases as pressure is changed). where K = Bulk Modulus of Elasticity (Pa, N/m2), dP = differential change in pressure on the object (Pa, N/m2), dV = differential change in volume of the object (m3), V0 = initial volume of the object (m3), P0 = initial pressure (Pa, N/m2), P1 = final pressure (Pa, N/m2), and V1 = final volume (m3)1.
where dρ = differential change in density of the object (kg m−3), ρ0 = initial density of the object (kg m−3), and ρ1 = final density of the object (kg m−3). The adiabatic bulk modulus of air/atmosphere is 0.142 MPa, meaning it is extremely deformable or compressible (Table 2). Explosive eruptions in subaerial environments are therefore often intense and far-reaching. In contrast, the bulk modulus of water is 2340 MPa, four orders of magnitude less compressible or deformable than air (Table 2; but >10× times smaller than the Young’s modulus of rock, 20000–70000 MPa; Karagianni et al., 2010). The intensity of explosive eruptions will therefore be greatly suppressed in submarine settings relative to their subaerial counterparts, and explosive shock waves produced during the eruption will be greatly attenuated close to source (Resnyansky and Delaney, 2006). Likewise, the attenuation effects of solid rock during subterranean explosions will result in only a very limited cone of deformation. The relationships summarized indicate that with increasing pressure, the Bulk Modulus rises and a material becomes less compressible. So, with increasing water depth, water becomes less compressible, less deformable, and will suppress explosive pressure or intensity more than at shallow water depths. Water at the interface between erupting magma and an ambient body of water can be superheated, in a process called film boiling, as a result of the extreme temperature difference between hot magma (800–1200°C) and cold water (<20°C; Figure 6a; Mills, 1984). High temperature contrasts and low ambient or hydrostatic pressures favor stable film boiling at the magma-water interface (Zimanowski and Büttner, 2003; Wohletz et al., 2013; Zimanowski et al., 2015). Diffusion of heat across the vapor film, which may be only mm to cm thick, is slow, so insulating the erupted magma and allowing viscous elastic crusts and coherent lavas to develop and propagate (Leidenfrost phenomenon). If the vapor film collapses, due to fluid instabilities related to decreasing magma temperatures, increasing confining pressures and shear between lavas and the water mass (Wohletz, 1986), direct magma-water interaction will occur leading to chilling of the magma to glass. Cooling contraction fractures will propagate instantaneously, and quench fragmentation and breccias will result (Figure 6b; van Otterloo et al., 2015). Film boiling can even occur at pressures and depths greater than the critical point of water (<22 MPa for fresh water and <30 MPa for sea water – 3 km deep at ∼407°C with 3.2 wt. % NaCl; Bischoff and Rosenbauer, 1988; Wohletz, 2003; Wohletz et al., 2013; Zimanowski et al., 2015). FIGURE 6. Film boiling at the interface between hot magma and a body of water. (a) Stable film boiling at the interface, leading to controlled heat lost across the vapor film and formation of a visco-elastic and progressively a coherent crust to the lava flow. (b) Vapor film collapse, leading to in situ rapid cooling of the magma at the interface through the glass transition, and rapid cooling contraction fracturing of the glass into an in situ, jigsaw-fit breccia. At low confining pressures and water depths (<10 MPa, 1000 m, and generally much less), the sudden collapse of the vapor film can lead to thermal detonation of liquid water as it hits the magma surface, resulting from instantaneous superheating and explosive boiling of the liquid water at the interface, leading to phreatomagmatic and/or explosive activity. Although phreatomagmatic activity could occur in water depths up to 1000 m, it generally only occurs in water depths up to a few hundred meters, because it requires a low density and pressure vapor film to be able to collapse instantaneously (Zimanowski and Büttner, 2003; Wohletz et al., 2013). Alternatively, vapor film collapse could lead to quench fragmentation. The heat capacity of water is 4× greater than air, and its thermal conductivity 25× higher (Table 2). Magmas erupting in deep-sea settings or lavas flowing into the sea, lakes or rivers are therefore prone to extremely high rates of cooling relative to subaerially erupted magmas or lavas because water acts as a heat sink. When in direct contact with cold liquid water, magmas or lavas instantaneously chill through the glass transition, causing thermal tensile stress, contraction and cracking of the glass, in a process called quench fragmentation or thermal granulation (Figure 6b; Kokelaar, 1986; Wohletz, 1986; Cas and Wright, 1987; Cas, 1992; van Otterloo et al., 2015; Cas et al., in press). Quench fragmentation is also a brittle fracturing process and should emit strong acoustic signals under water. Some acoustic signals associated with modern deep-water eruptions and interpreted as due to explosions (e.g., 2015 Axial Seamount lava forming eruption, Chadwick et al., 2016) could in fact result from tensile brittle fracturing of the glassy crusts of lavas during quench fragmentation. Quench fragmentation produces in situ breccias, commonly with angular blocks to ash size fragments of glassy debris called hyaloclastite (Pichler, 2011; de Rosen-Spence et al., 1980; Furnes et al., 1980; Cas and Wright, 1987; Cas, 1992; Cas and Giordano, 2014; van Otterloo et al., 2015; Figure 7). Hyaloclastite deposits preserve gradations from coherent lava in the core to in situ jigsaw-fit breccias to clast-rotated aggregates at the margins of a subaqueous lava (Figures 7a–d; Furnes et al., 1980; Cas and Wright, 1987; Cas, 1992; Batiza and White, 2000; White et al., 2000; Goto and Tsuchiya, 2004; Maeno and Taniguchi, 2006; Cas and Giordano, 2014; van Otterloo et al., 2015; White et al., 2015a; Soriano et al., 2016). When lavas or syn-depositional intrusions are in contact with water-saturated, unconsolidated sediments, they can also be quench fragmented, and the heated pore water in the sediments can convect vigorously and boil, leading to dynamic mixing of hyaloclasts and sediment, producing a chaotic volcanic clast-sediment breccia deposit called peperite (Figure 7e), which also grades back into jigsaw-fit breccia and coherent lava or intrusive rock in the core (Busby-Spera and White, 1987; Cas and Wright, 1987; Cas, 1992; Hunns and McPhie, 1999; Batiza and White, 2000; White et al., 2000; Gifkins et al., 2002; Skilling et al., 2002; Goto and Tsuchiya, 2004; Maeno and Taniguchi, 2006; Cas and Giordano, 2014; van Otterloo et al., 2015; White et al., 2015a; Soriano et al., 2016). FIGURE 7. Prehistoric subaqueous lavas and hyaloclastite. (a) Quench fragmented submarine Miocene dacite lava dome with in situ hyaloclastite breccia, Kariba, Hokkaido, Japan. Note the transition from the coherent to in situ, jigsaw-fit brecciated, flow-banded core, to progressively more intensively fragmented, finer breccia outwards. (b) Coherent to in situ fractured, Eocene-Oligocene, basaltic pillow lava with black, chilled, polygonally quench fractured glassy margins, and an internal fracture network, separated by bioclastic limestone (pale color), Boatmans Harbour, Oamaru, New Zealand. (c) In situ to clast-rotated pumice hyaloclastite breccia, Cala di Feola, Ponza, Italy. (d) Clast-rotated, probably resedimented, basaltic hyaloclastite breccia resulting from pervasive quench fragmentation of fluidal Eocene-Oligocene pillow lavas, Oamaru, New Zealand. (e) Rhyolite clast (pale) peperite breccia with black mudstone matrix, Late Devonian Boyd Volcanic Complex, Mimosa Rocks National Park, New South Wales, Australia. (f) Fractured and broken, poorly vesicular, submarine fire fountain spatter clast, in a matrix of blocky, coarse ash size, glassy fragments, fragmented by quench fragmentation in the submarine fire fountain, Miocene, Ryugazaki, Oshoro Peninsula, Hokkaido, Japan. (From Cas et al., 2003, Figure 8, reproduced under rights granted to authors by American Geophysical Union https://publications.agu.org/author-resource-center/usage-permissions/). Quench fragmentation is an in situ fragmentation process that can produce very large volumes of hyaloclastite breccia (Figures 7a–e), which is not explosive in origin and does not occur subaerially, unless lava flows into water (e.g., in Hawai’i) or erupts sub-glacially (e.g., Iceland). It has been underestimated as the origin for volcanic breccias in subaqueous settings, which are often described as explosive or pyroclastic in origin, when in fact they are much more likely to be autoclastic. When volcanic breccias and even ash-size deposits are found in subaqueous settings, the first and most likely hypothesis to test is: are these hyaloclastite, and if not, what is the evidence based on textural characteristics, context, analysis or physical processes, rather than assuming that they are pyroclastic? The high heat capacity, thermal conductivity, and hydrostatic pressure constraints of water indicate that explosive origins become less likely with increasing water depths. For lavas that have vesiculated to high degrees, but have not been fragmented explosively, the pumice carapaces can also be quench fragmented, producing pumice hyaloclastite (Figures 5c,d, 7c; de Rosen-Spence et al., 1980; Furnes et al., 1980; Cas and Wright, 1987; Kurokawa, 1991; Cas, 1992; McPhie et al., 1993; Scutter et al., 1998; Scutter, 1999; Binns, 2003; Carey et al., 2018; Manga et al., 2018). 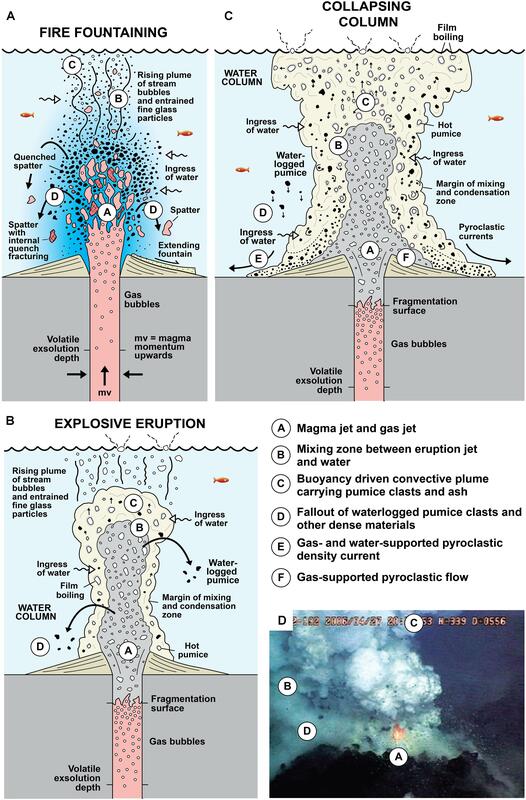 In addition, spatter ejected from submarine fire fountains will be subject to quench fragmentation in the water column and plume above the vent (Figure 8A), producing blocky, ash size glassy fragments and fractured spatter fragments (Figure 7f), that then become entrained and dispersed in thermal plumes of seawater above the fountain (Cas et al., 2003), again producing non-explosive, hyaloclastic ash-size fallout deposits. FIGURE 8. Subaqueous eruption column characteristics. (A) Deep-water fire fountain column, showing quench fragmentation of spatter clasts in the column and the water mass above the vent. (After Cas et al., 2003, Figure 14A, under rights granted to authors by American Geophysical Union https://publications.agu.org/author-resource-center/usage-permissions/). (B) Complex processes contributing to the dynamics of a relatively deep-water, subaqueous explosive eruption column as a result of initial bubble decompression and expansion, then cooling, condensation and water ingress into a subaqueous eruption column upward. (C) Schematic diagram of a relatively shallow water (tens to hundreds of meters) explosive eruption column collapsing around the vent. The rising buoyant column is subject to condensation of gasses and mixing in of ambient water. Large pumice clasts become water-logged, contributing to collapse of the column, forming a hot mass-flow of pyroclastic debris, steam and water on the seafloor. (After Kano et al., 1996, Figure 12; Permission from Elsevier). (D) Small, suppressed explosion of small ejecta, with a core of incandescent lava or fire fountain, in 2006, Brimbank Crater, NW Rota 1 volcano, Marianas arc, water depth ∼550 m. (From Chadwick et al., 2008, Figure 9E, under usage permissions for academic works policy of the American Geophysical Union https://publications.agu.org/author-resource-center/usage-permissions/). Another effect of the high heat capacity and thermal conductivity of water is that water directly above a vent and above propagating seafloor lava flows is quickly heated, decreasing its density by 10% relative to cold seawater (∼900 kg m−3 vs. 1,027 kg m−3; Safarov et al., 2009; Sharqawy et al., 2010), so producing buoyant plumes of hot seawater. In deep water, as lavas propagate and form a chilled glassy crust, the thermal stresses associated with cooling cause ash size glass particles to exfoliate (‘popping”) from the surfaces of lavas (White et al., 2015a). Hot thermal plumes of water that rise above the vent and above propagating seafloor lavas (cf. Barreyre et al., 2011) can entrain such ash size glassy fragments and disperse them, forming ash fallout deposits of hyaloclastite debris. 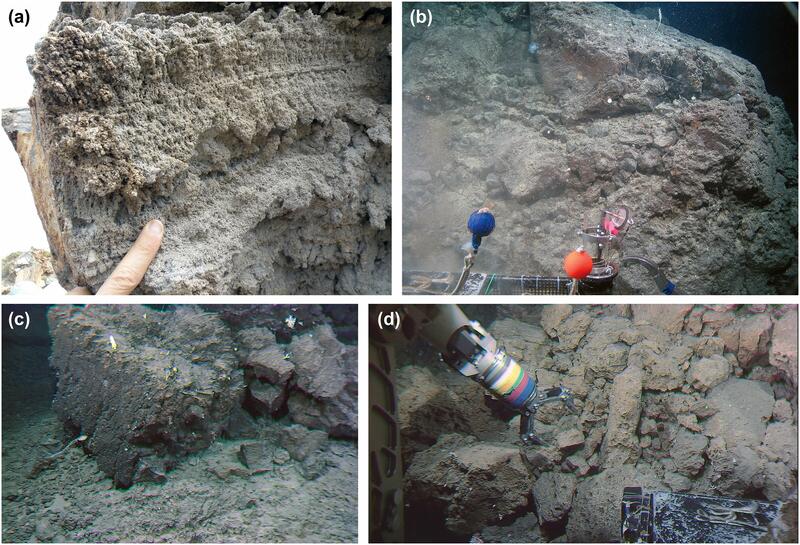 Deep-sea “ash” deposits associated with young seafloor lavas (e.g., ash found after the 2015 seafloor lava-forming eruption from Axial Seamount on the East Pacific Rise), are often interpreted as pyroclastic in origin (e.g., Chadwick et al., 2016), which is unlikely given the water depth of >1500 m, as discussed above. They are more likely to be hyaloclastic fallout deposits dispersed by thermal seawater plumes rising above the newly erupting lavas. The heat capacity and thermal conductivity of water also plays a critical role in determining the dynamics of subaqueous eruption columns, through heat exchange between the eruption column and the ambient water body (e.g., physical ingress and mixing of cold water along the margins of eruption columns into the core, the cooling and condensation of gas bubbles by the water mass). The change in plume dynamics results from a change in the physical state of the plume, particularly temperature, density, and the proportions of water and gas. These factors each influence the dispersal capacity of submarine plumes, which will be discussed below. Whitham and Sparks (1986) first demonstrated that if hot pumice with gas filled vesicles comes in contact with cold water, a large proportion of them quickly become water-logged, denser and sink. This process can affect both pyroclastic and autoclastic (hyaloclastite) pumice. It is due to the cooling and condensation of hot gasses in vesicles, resulting in a pressure gradient from high in the host, dense water mass to low in vesicles in pumice clasts, which forces external water into the vesicles if permeability pathways exist. This then increases the bulk density of the pumices, in some cases to higher values than water, which causes them to sink (cf. Figure 5d). Water-logging and densification of pumice by this process can occur syn-eruptively in subaqueous eruption columns (Whitham and Sparks, 1986; Allen et al., 2008; Carey et al., 2018; Manga et al., 2018), whereas pumices with low permeability will retain a density lower than water, will be buoyant and will float for a long time (Fauria et al., 2017). Some may, however, eventually become water-logged through slow infiltration of water, even when cold after drifting around for weeks to years on the sea surface (Fauria et al., 2017). Subaerial eruption columns and plumes result from the buoyant rise or uplift of a mixture of mostly hot gas, with dispersed water droplets, and solids, driven initially by explosive gas thrust, and the low density and buoyancy of hot gas relative to the density of the atmosphere. In subaerial settings, in addition to hot volcanic gas from the vent, the heating of cold air entrained from the atmosphere through turbulent mixing into the eruption column at its margins helps to maintain a low bulk density and contributes to turbulent plume rise. The decreasing density of the atmosphere with increasing altitude, from ∼1.225 kg m−3 at sea level to 0.004 kg m−3 at 40 km altitude (United States Standard Atmosphere Air Properties), results in a decrease in relative plume buoyancy and rise rates with increasing height in the atmosphere, becoming neutrally buoyant at a height governed by plume density relative to the surrounding atmosphere; they can rise to 50 km above the vent. In subaqueous settings, plumes of (super-)heated water, supercritical fluid and gas (± solids) form above submarine vents and advancing lava flows away from the vent. Theoretically, the plumes can rise through the entirety of the water column and breach the sea surface if their upward momentum is high, after which they behave more or less like subaerial eruption columns. However, this is more likely from shallow water vents where the eruption column is gas-charged, or seawater has been explosively superheated (e.g., 1952–1953 Myojinsho shallow submarine eruption, Japan; Fiske et al., 1998). From deep-water vents, eruption columns can be significantly modified above the vent by cooling, condensation of gasses and mixing in of cold, dense ambient water, so that their heights are often limited to the depth of the ocean/water body at the location of the eruption. Considering all submarine eruptions occur at water depths of <5000 m, submarine eruption columns are generally limited in height to a few kilometers to hundreds of meters, which constrains how column behavior controls pyroclast dispersal, compared with usually higher subaerial eruption columns. Heated seawater at several hundred °C can be 10% less dense (∼900 kg m−3; Safarov et al., 2009; Sharqawy et al., 2010) than the density of cold sea water (1020 kg m−3 at sea level to 1030 kg m−3 at depths >1000 m; Garrison, 2012; Gladkikh and Tenzer, 2012), and therefore is buoyant. However, cold seawater can be mixed into the margins of the column, particularly if there is a significant density difference between the column and the ambient water, creating a pressure difference between the two, which will drive cold seawater laterally into the column. As a result, a hot plume of seawater above a vent will cool, become denser and lose buoyancy upward (Whitham and Sparks, 1986; Allen et al., 2008). If volatile bubbles are released from a subaqueous vent, they will further reduce the density of the water column or eruption plume rising above the vent. Bubbles will be densest at the vent because the hydrostatic pressure is greatest at the seafloor. As bubbles rise buoyantly in the eruption column to shallower water depths and lower hydrostatic pressures, they decompress and theoretically should expand and cause the eruption column to become less dense and become more buoyant upward. However, subaqueous eruption columns with a significant gas bubble fraction are also affected by cooling and condensation erosion of gas bubbles, due to the high heat capacity and thermal conductivity of the water column (Kano et al., 1996; Allen et al., 2008; Cas and Giordano, 2014), and by water ingress driven by a density and pressure gradient from the dense ambient water mass into the gaseous eruption column (Figures 8B,C). Gas bubbles under high ambient pressure can also collapse or implode as they cool and adjust to ambient pressure. For example, the only imaged subaqueous explosive events (NW Rota, Marianas arc, Chadwick et al., 2008; Deardorff et al., 2011; West Mata eruption, Lau Basin, Resing et al., 2011; Embley et al., 2014) formed very small, eruption columns only meters high. The gas-rich column from the 2006 submarine eruption of NW Rota (Marianas arc) at a depth of ∼550 m and temperature of 700°C dissipated within 2 m of leaving vent (e.g., Figure 8D; Chadwick et al., 2008; Deardorff et al., 2011). This could be due to cooling condensation effects and implosions of under-pressured volatile bubbles in magma or in the subaqueous eruption column. Mitchell et al. (2018) integrated some of these concepts into a model for the eruption column resulting from the wholly submarine eruption of Havre volcano, Kermadec arc, north of New Zealand in 2012 (Carey et al., 2018; Manga et al., 2018). Mitchell et al. (2018) proposed that the release of gasses at the vent affected the eruption column by making it less dense and highly buoyant, although cooling upward made it denser. They also suggest that such reductions in density and therefore hydraulic pressure in the eruption column at the depth of the vent have the capacity to change eruption styles (e.g., triggering explosive activity where otherwise non-explosive activity would be expected because of normal hydrostatic pressure constraints). However, their argument is based on speculative gas bubble abundances in the eruption column, not based on quantitative modeling of likely gas release rates from the erupting vesiculating lava domes. In particular, one of the free gas bubble abundances proposed, 75 vol% in the water column, is highly unlikely at depths of 900 m. This assumed bubble abundance may be based on the fact that the vesicularity of the Havre pumice is very high (∼70 vol. %) suggesting that this volume of free gas bubbles is released into the water mass at the same time as the pumice is being released. This could only happen if all bubble walls in the erupting pumiceous magma were bursting at the time of the eruption or in the column, which should then produce more ash glass shards than pumice clasts, for which there is little evidence. The concept could perhaps work where vents lie at shallow water depths of a few hundred meters or less, at much lower hydrostatic pressure, and higher gas overpressure, almost simulating subaerial conditions with high gas over-pressures. In addition, syn-eruptive cooling and water logging of pumice clasts in rising subaqueous eruption columns will cause the columns to cool and become denser and may even lead to gravitational collapses of parts of eruption columns, producing subaqueous volcaniclastic density currents and deposits around the vent, which are water-supported mass flows of volcanic debris (Figure 8C; Kano et al., 1996; Allen et al., 2008). This is analogous to subaerial pyroclastic density currents, which are gas supported. If eruption mass flux is high enough, column collapse-generated subaqueous mass flows that are briefly gas-supported could travel limited distances from vent, producing limited true subaqueous pyroclastic density current deposits (e.g., Busby-Spera, 1984, 1986; Cas and Wright, 1987, 1991), before water mixes into such flows and condensation of gas occurs, transforming them into water-supported mass-flows (Cas and Wright, 1987, 1991). In summary, subaqueous eruption columns and plumes are therefore likely to have very different buoyancy properties, experience greater ephemeral changes to buoyancy properties, and therefore different dynamics, compared with subaerial eruptions columns. In particular, every subaqueous eruption, including both effusive and explosive eruptions, will produce a subaqueous eruption column or hot water plume. Subaqueous eruption columns resulting from effusive eruptions can disperse non-explosively generated autoclastic pumice and ash size hyaloclasts to produce autoclast fallout deposits. This is very different from subaerial effusive eruptions, which can generate gas plumes capable of carrying very fine glassy ash popped off the surfaces of cooling lavas, but not coarse pumice clasts. Furthermore, deep-water subaqueous eruption columns are much more height limited than subaerial counterparts, which has implications for dispersal of pyroclasts, compared with subaerial eruption columns. During subaerial explosive eruptions, no clasts are spontaneously buoyant if ejected into the still atmosphere, because ρallclasts > ρatmosphere. However, buoyant eruption columns can entrain pyroclasts if the gas turbulence velocity and column up-rise velocity exceeds the terminal fall velocity of the pyroclasts. In seawater, however, all vesiculated pyroclasts or autoclasts with ρ < 1020 kg m−3 are spontaneously buoyant, irrespective of the dynamics of the associated subaqueous plume, and can rise to the surface of the water column if they do not become water-logged in transit. Even clasts with ρ > 1020 kg m−3 have a reduced effective weight in water relative to air and can be more easily entrained and transported in subaqueous plumes compared with subaerial plumes. Conversely, the rise (and settling) velocities of clasts in the water column are reduced relative to pyroclasts erupted at subaerial vents, because of the high density, relative viscosity and the viscous drag effects of water compared with air (Figure 9; Cashman and Fiske, 1991; Fiske et al., 1998). FIGURE 9. Terminal settling velocities of pyroclasts of different grain sizes and densities in air and in water according to the Stokes’ Settling Law, showing orders of magnitude slower velocities in water than in air. (After Cashman and Fiske, 1991, Figure 2; permission American Association for Advancement of Science). The dispersal and sedimentation behavior of pumice clasts by subaqueous eruption columns through the water column and from floating masses of pumice (called “pumice rafts”) that form at the sea surface reflects the grain size, vesicularity characteristics (e.g., vesicle size and distribution pattern, permeability), the rate at which clasts become infiltrated by water, the resultant density of clasts, and the prevailing currents and wave patterns (Whitham and Sparks, 1986; Kato, 1987; Manville et al., 1998; Allen and McPhie, 2000; Bryan et al., 2004, 2012; Allen et al., 2008; Fauria et al., 2017; Manga et al., 2018). Water-logged pumice clasts whose bulk density exceeds that of water can sink and be deposited around the eruption vent, although Cashman and Fiske (1991) noted that the settling velocity of pumice clasts is markedly slower in water than in air (Figure 9). However, pumice clasts that do not have a permeable network of vesicles can retain their low bulk density and float (Fauria et al., 2017), often forming extensive “rafts” of pumice debris that float away from the vent area, pushed thousands of kilometers by marine currents, waves and wind to foreign shores (Bryan et al., 2004, 2012; Jutzeler et al., 2014). For example, pumice from the submarine eruptions along the Tonga arc in 2001 (Bryan et al., 2004), 2006 (Home Reef volcano eruption; Figure 10a; Bryan et al., 2012), and the 2012 Havre volcano eruption in the Kermadec arc (Figure 10b; Jutzeler et al., 2014), was deposited along Australia’s eastern seaboard for years after those eruptions, transported thousands of kilometers by flotation by currents and waves. FIGURE 10. (a) Raft of pumice clasts resulting from the Home Reef volcano eruption from 7 to 16? August 2006, Tonga volcanic arc, southwest Pacific. Source: NOAA; Photo taken by Fredrik on the yacht Maiken, August, 17, 2006. 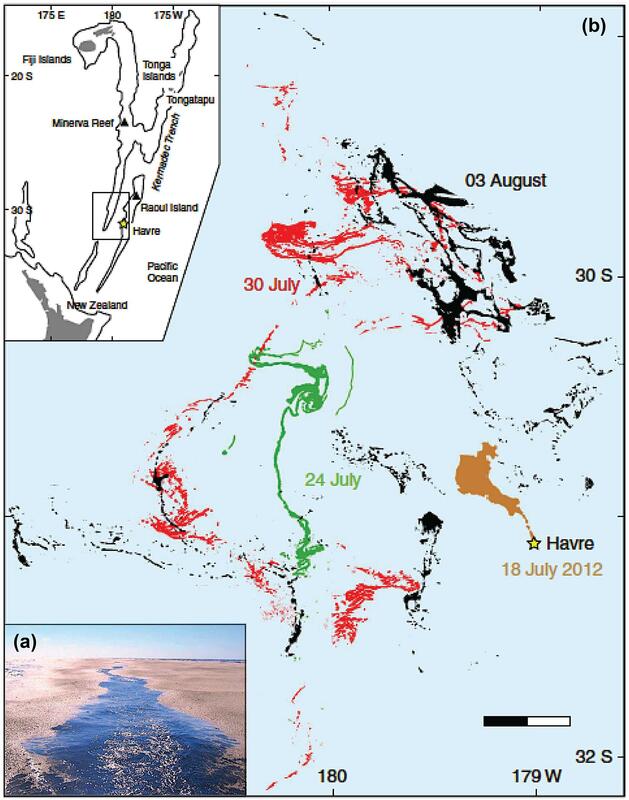 (b) Drift pattern of the pumice raft resulting from the July 18, 2012 submarine eruption of the submarine Havre volcano in the Kermadec volcanic arc depicted on different dates after the eruption. (From Jutzeler et al., 2014, Figure 1, Nature Communications, without change except for part (a) inserted, under Creative Commons Attribution 3.0 Unported License CC by 3.0). Surface currents and waves can produce very irregular, changing and circuitous dispersal patterns, reflected by changing pumice raft shapes and drift directions (Figure 10b; Bryan et al., 2004; Carey et al., 2014; Jutzeler et al., 2014). Different current directions at different depths in the ocean may also affect the distribution and dispersal of clasts. Water settled seafloor deposits of rafted pumice pyroclasts and autoclasts also often coarsen or show no systematic down current variations in grain size (Jutzeler et al., 2014; cf. subaerial fallout deposits). In addition, ash sized particles within deep-sea tephra layers could in fact be generated by abrasion between pumice clasts during transit in pumice rafts (Jutzeler et al., 2014), or through quench spalling from the surfaces of hot lava flows. Such fine “ash” deposits are not syn-eruptive pyroclastic fallout and do not reflect eruption intensity. This contrasts with true subaerial pyroclastic pumice fall deposits, which are dispersed radially around the vent on a windless day, or asymmetrically by strong atmospheric winds following relatively linear paths away from the vent. The deposit grain size decreases downwind with increasing distance from the vent, and exhibits distribution patterns that reflect plume height, and prevailing wind direction and strength (Carey and Sparks, 1986; Bonadonna and Costa, 2013). Few of these controls apply to submarine pumice-forming eruptions and their columns. (1) Pyroclastic fallout from subaerial vents and fallout through the water column. (2) Near-vent fallout from subaqueous vents. (3) In situ autoclastic pumice (mostly quench fragmentation of erupting submarine vesicular magma = in situ pumice hyaloclastite). (4) Buoyant detachment of block (incl. house size) to lapilli size pumice from autoclastically fragmenting erupting vesicular magma and dispersal by flotation. (5) Post-eruptive sedimentation from far traveling pumice rafts originating from subaqueous vents from either explosive or effusive eruptions. (6) Syn- and post-eruptive mass flow resedimentation from shallow water into deep-water. Cas and Giordano (2014) have briefly considered this topic and advise against using terms ascribed to subaerial explosive eruption styles and deposits for subaqueous eruptions and deposits. Subaerial explosive eruption styles and deposits are defined on measurable quantitative parameters, such as eruption column height, dispersal patterns and distances of the deposits, grain size and sorting characteristics relative to dispersal patterns and areas, etc. (Walker, 1973; Cas and Wright, 1987; Cas et al., in press). These parameters cannot be easily applied to subaqueously erupted deposits because the dispersal processes of vesiculated clasts are influenced by very different processes and conditions in marine environments, and data on dispersal and grain size characteristics are very rarely available or collectable. We first need to decide on what descriptive and measurable parameters are most useful and what the significance of those parameters is before we can begin to develop a terminological approach. The data base on both modern and ancient deep-water submarine volcanic successions is much less than for subaerial volcanic successions, which is reflected in the much more limited understanding of the properties of magmas erupting in deep-water, the physics of eruption processes and submarine eruption plumes, pyroclast dispersal processes and behavior of both autoclasts and pyroclasts during transport/dispersal and sedimentation. In most cases we don’t actually know the location of the source vents, so we can’t relate deposit characteristics to distance from vent. As a result, to further advance understanding of submarine volcanic processes we need continuing documentation of both modern and ancient volcanic settings through detailed mapping, logging of sections and sample collection. In ancient settings, this will involve traditional mapping methods as well as application of remote sensing methods and data sets such as LiDAR, radiometrics, magnetics, drone based imagery, aerial image interpretation, and in some cases diamond drilling. In modern settings, high resolution seafloor bathymetric surveying using submersibles including “manned” submersibles, remotely operated submersible vehicles (ROV’s) and autonomous underwater vehicles (AUVs), imagery and sampling using submersible vessels are essential, together with coring. In addition, further modeling of the physics of deep-water eruptions, eruption columns, magma properties, volatile properties, fragmentation processes (including autoclastic and pyroclastic) and dispersal processes based on factual data is required to help better understand them and to bring understanding to the same level as for subaerial eruption processes. • Vesiculation can occur at any depth in the crust and at any water depth if the magmatic volatile content is sufficiently high, but the state of the exsolved fluids (supercritical fluid, gas) depends on the water depth and confining pressure. • The growth rates of exsolved volatiles (bubbles) at pressures approaching 22 MPa (the critical point of water; ∼2200 m water depth) are insufficient to drive explosive fragmentation. Explosive eruptions at water depths <1000 m are more likely. • Slow, non-explosive vesiculation of magma at high pressures can produce highly vesicular lavas and even coherent pumice, which if quench fragmented produces pumice hyaloclastite breccia. High levels of vesicularity are not an indicator of explosivity. • Magmas erupting in deep-sea settings are initially less viscous than subaerial counterparts, and more prone to erupt effusively or as fountains because of suppressed volatile exsolution. Deep-water fountains are jets of fluid magma, but not explosive. • Magmas erupting into water are prone to high rates of cooling because of the high heat capacity and thermal conductivity of water, commonly leading to quench fragmentation and formation of hyaloclastite breccia, which is rare subaerially. • Submarine eruption columns and particulate hot water plumes can be generated by both explosive and effusive eruptions. Submarine eruption columns behave differently to subaerial columns, and can be dissipated by cooling condensation effects, implosions of gas bubbles, and ingress of cold ambient water. • Subaqueous effusive eruptions can produce subaqueous fallout deposits of ash size autoclastic vitric material and even fallout deposits of autoclastic pumice. • The height of submarine eruption columns is limited to the water depth at the vent (<5 km high), except in shallow water, which affects dispersal processes, whereas subaerial explosive eruption columns are not comparably height limited, being potentially an order of magnitude higher (<50 km high). • Dispersal of pumice (autoclastic or pyroclastic) from submarine eruption columns is much more circuitous than for subaerial columns, is a function of changing wind, wave and current directions, and can take months to years. • Pumice deposits in the oceans are not necessarily pyroclastic, and can be autoclastic or resedimented in origin. • Terminology developed for subaerial explosive eruption styles and deposits is unsuitable for subaqueous eruption processes, styles and deposits, and is often incorrect. A new approach to classifying submarine eruption styles and deposits is required, based on careful assessment of deposit characteristics. RC and JS worked jointly on the text and the preparation of figures. The handling Editor declared a past co-authorship with the author RC. This review has resulted from decades of interest and research on submarine volcanic processes by the senior author and numerous insightful discussions with volcanological colleagues at Monash University, the University of Tasmania, and the international volcanological community at scientific meetings. We thank RA, MP, guest editor CS and journal editor Valerio Acocella for helpful comments and suggestions that improved the manuscript. Batiza, R., and White, J. D. L. (2000). “Submarine lavas and hyaloclastite,” in Encyclopedia of Volcanoes, eds H. Sigurdsson, J. Stix, B. F. Houghton, S. R. McNutt, and H. Rymer (San Diego, CA: Academic Press), 361–382. Binns, R. A., (2003). “Deep marine pumice from the Woodlark and Manus Basins, Papua New Guinea,” in Explosive Subaqueous Volcanism, eds J. D. L. White, J. L. Smellie, and D. A. Claque (Washington, DC: American Geophysical Union), 329–343. Brennen, C. E. (1995). Cavitation and Bubble Dynamics. Oxford: Oxford University Press. Cas, R. A. F., Giordano, G., and Wright, J. V. (in press). Volcanology – Processes, Deposits, Geology and Resources. Berlin: Springer. Cas, R. A. F., and Wright, J. V. (1991). Subaqueous pyroclastic flows and ignimbrites: an assessment. Bull. Volcanol. 53, 357–380. Cas, R. A. F., Yamagishi, H., Moore, L., and Scutter, C. R. (2003). “Miocene submarine fire fountain deposits, Ryugazaki Headland, Oshoro Peninsula, Hokkaido, Japan: implications for submarine fountain dynamics and fragmentation processes,” in Explosive Subaqueous Volcanism, Vol. 140, eds J. D. L. White, J. L. Smellie, and D. A. Clague (Washington, DC: American Geophysical Union), 299–316. Cashman, K. V., Sturevant, B., Papale, P., and Navon, O. (2000). “Magmatic fragmentation,” in Encyclopedia of Volcanoes, eds H. Sigurdsson, J. Stix, B. F. Houghton, S. R. McNutt, and H. Rymer (San Diego, CA: Academic Press), 421–430. Druitt, T. H., Edwards, L., Mellors, R. M., Pyle, D. M., Sparks, R. S., Lanphere, M., et al. (1999). Santorini volcano. Geol. Soc. Lond. Mem. 19:165. Druitt, T. H., and Kokelaar, B. P. (eds.) (2002). The eruption of Soufrière Hills volcano, Montserrat, from 1995 to 1999. Geol. Soc. Lon. Mem. 21:645. Fiske, R. S., Naka, J., Iizasa, K., and Yuasa, M. (1995). Caldera-forming submarine pyroclastic eruption at Myojin Knoll, Izu-Bonin arc. JAMSTEC J. Deep Sea Res. 11, 315–322. Fujibayashi, N., and Sakai, U. (2003). “Vesiculation and eruption processes of submarine effusive and explosive rocks from the middle miocene ogi basalt, Sado Island, Japan,” in Explosive Subaqueous Volcanism, eds J. D. L. White, J. L. Smellie, and D. A. Clague (Washington, DC: American Geophysical Union), 259–272. Garrison, T. S. (2012). Essentials of Oceanography. Belmont, CA: Brooks/Cole Cengage Learning. Giordano, G., de Benedetti, A. A., Diana, A., Diano, G., Esposito, A., Fabbri, M., et al. (2010). Stratigraphy, volcano tectonics and evolution of the Colli Albani volcanic field. Geol. Soc. Lon. Spec. Publ. 3, 43–98. Lesher, C., and Spera, F. J. (2015). “Thermodynamic and transport properties of silicate melts and magma,” in The Encyclopedia of Volcanoes, eds H. Sigurdsson, B. Houghton, S. R. McNutt, H. Rymer, and J. Stix (San Diego, CA: Academic Press), 113–141. McPhie, J., Doyle, M., and Allen, R. (1993). Volcanic Textures: A Guide to the Interpretation of Textures in Volcanic Rocks. Hobart TAS: CODES Key Centre, University of Tasmania, 196. Moore, J. G. (1975). Mechanism of formation of pillow lava: pillow lava, produced as fluid lava cools underwater, is the most abundant volcanic rock on earth, but only recently have divers observed it forming. Am. Sci. 63,269–277. Newhall, C. G., and Punongbayan, R. (eds). (1996). Fire and Mud: Eruptions and Lahars of Mount Pinatubo, Philippines: Philippine Institute, 1126. Pioro, I., and Mokry, S. (2011). “Thermophysical properties at critical and supercritical pressures,” in Heat Transfer-Theoretical Analysis, Experimental Investigations and Industrial Systems. ed. A. Belmiloudi (Rijeka: InTech published), 573–592. Poland, M. P., Takahashi, T. J., and Landowski, C. M. (eds). (2014). Characteristics of Hawaiian Volcanoes: U.S. Geological Survey Professional. Heidelberg: Springer. Resnyansky, A. D., and Delaney, T. G. (2006). Experimental Study of Blast Mitigation in a Water Mist Weapons Systems Division. Edinburgh, SA: Defence Science and Technology Organisation. Scarfe, C. M., Mysen, B. O., and Virgo, D. (1987). Pressure dependence of the viscosity of silicate melts. Magmat. Process. Physicochem. Princip.1, 59–67. Scutter, C. R. (1999). Characteristics and Origins of Subaqueous Silicic Hyaloclastites, Ponza, Italy and Southwestern Hokkaido, Japan. Ph.D. thesis, Monash University, Melbourne, VIC, 550. Soriano, C., Cas, R.A. F., Riggs, N. R., and Giordano, G. (2016). “Submarine volcanism of the cabo de gata magmatic arc in the betic-rif orogen, se spain: processes and products,” in Updates in Volcanology – From Volcano Modelling to Volcano Geology, Chap. 12, ed. K. Nemeth (Rijeka: InTech). Spera, F. J. (2000). “Physical properties of magma,” in Encyclopedia of Volcanoes, eds H. Sigurdsson, J. Stix, B. F. Houghton, S. R. McNutt, and H. Rymer (San Diego, CA: Academic Press), 171–190. Wallace, P. J., and Anderson, A. T. (2000). “Volatiles in magmas,” in Encyclopedia of Volcanoes, eds H. Sigurdsson, J. Stix, B. F. Houghton, S. R. McNutt, and H. Rymer (San Diego, CA: Academic Press), 149–170. White, J. D. L., Smellie, J. L., and Clague, D. A. (2003). “Introduction: a deductive outline and topical overview of subaqueous explosive volcanism,” in Explosive subaqueous Volcanism. Geophysical Monograph, eds J. D. L. White, J. L. Smellie, and D. A. Clague (Washington, DC: American Geophysical Union),1–23. Zimanowski, B., Büttner, R., Dellino, P., White, D. L., and Wohletz, K. H. (2015). “Magma-water interaction and phreatomagmatic fragmentation,” in The Encyclopedia of Volcanoes, eds H. Sigurdsson, B. Houghton, S. R. McNutt, H. Rymer, and J. Stix (Amsterdam: Elsevier), 473–484. Copyright © 2018 Cas and Simmons. This is an open-access article distributed under the terms of the Creative Commons Attribution License (CC BY). The use, distribution or reproduction in other forums is permitted, provided the original author(s) and the copyright owner(s) are credited and that the original publication in this journal is cited, in accordance with accepted academic practice. No use, distribution or reproduction is permitted which does not comply with these terms.